I joined Rachael’s LV charm swap, taking two spots, to be on the safe side. So how long do you reckon this lot will last for? Good for you! I hope these lovelies last a while. I'd best make sure I use LV in my blocks in Feb then to make sure that these don't go to waste then. 😉 Thanks you for your forward planning. Great fabric. In a way I am tried of the LV too. However, then I see the prettiness and think well maybe…. At first I was like what in the world is LV, he he. OK I got it 🙂 My guess is it'll survive 2013 for sure. Have fun with those in fastly uproaching New Year! I am so not a LV girl either, but I am sure your Bee mates will be thrilled with these fabrics in their blocks! Any excuse to buy fabric!!!!! Not very long if I know you. I am woefully lacking in that department!! The swap, I'd never have got that variety on my own. Your stack looks lovely! Not long if those voracious bee mates are anything to go by! You know what they say about the 6 P's! Think you're set now :). Better go check my stash! Well scored! LV appetites seem insatiable in bees so I think this will all get put to very good use. Nice blog changes for the New Year Katy. 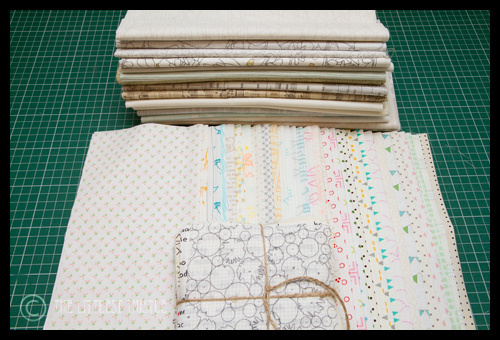 The rate you sew and create at I think you'll be through this lot in about a month ! Erm, about 6 months? :)I'm liking your new blog look!